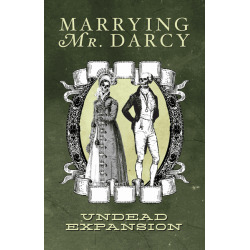 The Marrying Mr. Darcy: Undead Expansion adds the threat of the walking undead to the heroines' attempts to build their character and marry well. 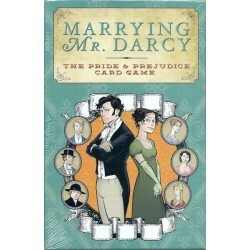 Why not spice up the humdrum of social pleasantries and chasing suitors with the very pressing need to barricade the doors of Pemberley with the piano forte? Yes, the curse of the undead has touched both the women and suitors of Marrying Mr. Darcy in the new Marrying Mr. Darcy Undead Expansion. 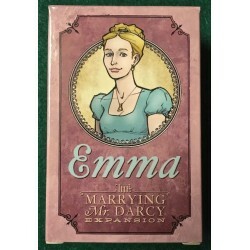 Marrying Mr. Darcy is a strategy card game where players are one of the female characters from Jane Austen’s novel Pride and Prejudice. Players work to earn points and attract the attention of available suitors. Our heroines do this by attending events and improving their characters, but advantage can be gained by the use of cunning. All of their efforts are in hopes of marrying well and becoming the most satisfied character at the end of the game!